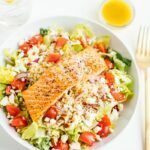 Inspired by a menu item from one of my favorite spots in Richmond, this Mediterranean salmon salad is loaded with flavor, incredibly healthy and gluten-free. Now on to this recipe! I’m so excited about this one, you guys. It is SO good and reminds me of warmer days. 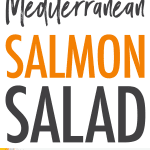 Whenever I go to The Daily Kitchen and Bar, I get the Mediterranean salad and add salmon. 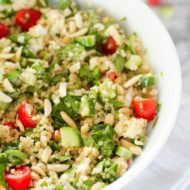 It’s the perfect mix of greens, quinoa, crudité, chickpeas, feta, almonds and lemon chipotle vinaigrette. And I can’t forget the side of sweet potato fries I always order. My definition of the perfect dinner. I love finding inspiration from restaurants and it’s always so exciting when I figure out how to recreate my favorite meal in my own home. I already have an awesome baked sweet potato fries recipe, and now I have a recipe for this salad! All I need is a fun cocktail (The Daily serves a watermelon kombucha martini that’s amazing) or glass of rosé on the side to complete my dining experience. Preheat oven to 400°F. Rub the salmon with olive oil and season both sides with salt and pepper. Place fillet skin-side down on a baking sheet, pour the lemon juice over top and roast for 10-12 minutes or until just cooked through. Time will vary based on the size of your salmon. Watch it carefully as you don’t want to overcook it. 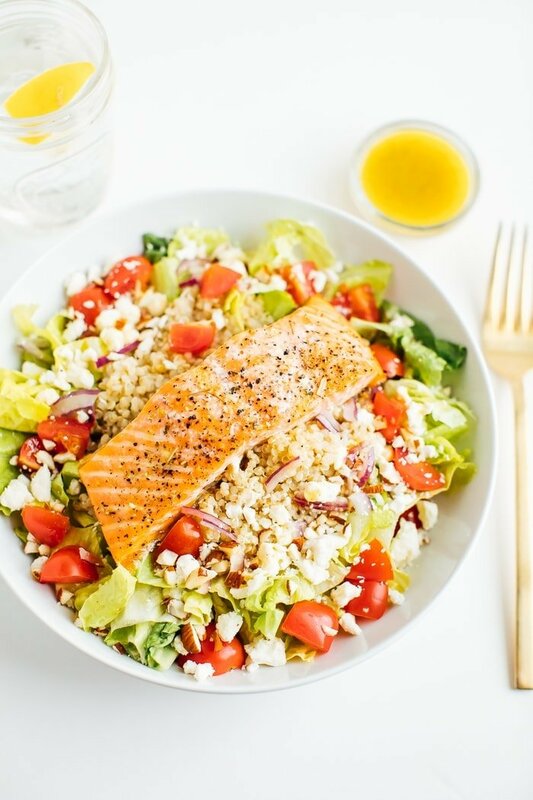 While salmon is cooking, make dressing by whisking together all the ingredients. Prep salad by adding chopped romaine to a large salad bowl, and top with quinoa, red onion, tomatoes, feta cheese and chopped almonds. 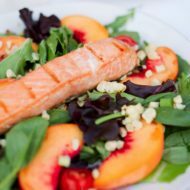 Once salmon is cooked through, remove from oven and place it on top of salad. Drizzle dressing over salad and enjoy. 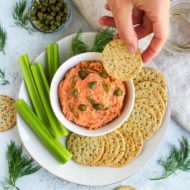 This recipe serves one but it can easily be scaled to serve 2-4 people. In case you haven’t checked it out yet, I have a Guide to Richmond, Virginia where you’ll find my favorite grocery stores, shops, farmer’s markets and restaurants (including The Daily!). Have you recreated any of your favorite restaurant meals? I can always go for a salmon salad! I tried to pin this but I followed the link and didn’t see it anywhere on your boards.